1. 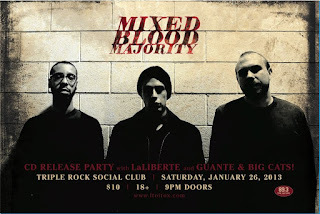 Me and Big Cats will be playing the Mixed Blood Majority Release party on 1/26 at the Triple Rock in Minneapolis. 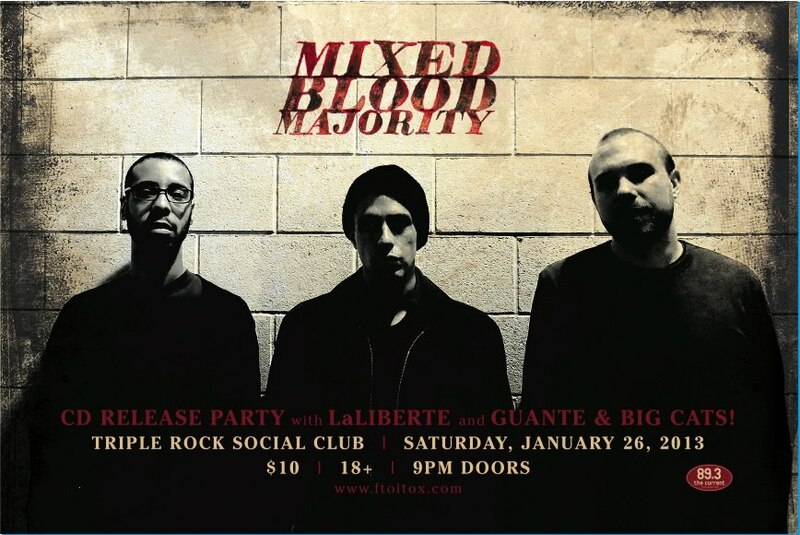 MBM is an indie-rap supergroup: Lazerbeak from Doomtree, Joe from No Bird Sing and Crescent Moon from Kill the Vultures. If you know me but don't follow the scene so much, you may still recognize them-- I did a song with Joe, a song with Crescent Moon, and a song over a Lazerbeak beat for a Doomtree contest. They're a special collection of artists, and it should be a great show. It'll also likely sell out, so get your tickets now. 2. I've been working with Tish Jones on the K.N.E.W. 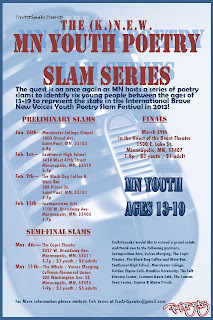 MN Youth Poetry Slam series, and the prelim slams start at the end of January. 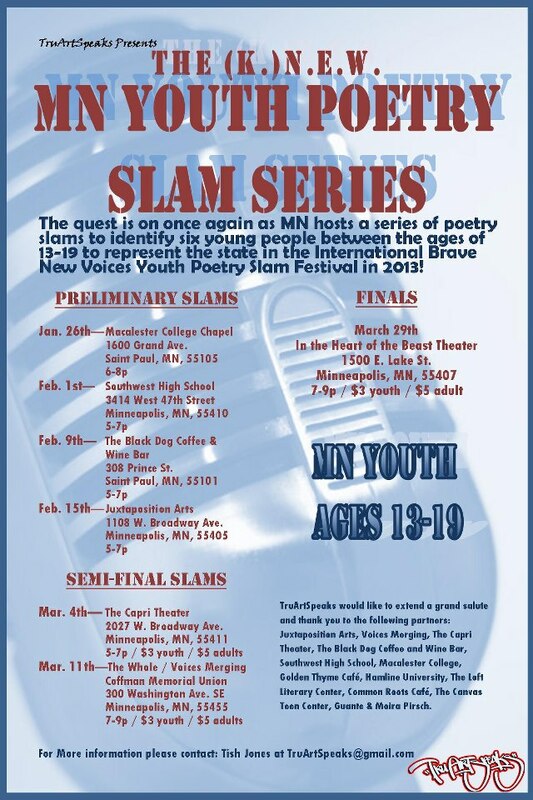 This series of poetry slams will pick the team of teens who will represent MN at the 2013 Brave New Voices youth poetry festival. If you're a teen poet between the ages of 13-19, you can show up to ANY or ALL of the prelim slams, share a couple of poems, and get a chance to advance to semis. The dates and locations are on the flyer above, and there's more info at our Facebook page. Additionally, if you are a teacher, youth worker, or just know people who might be interested, please spread the word. 3. A random note: Guante & Big Cats were selected by Reddit users as a "Best of 2012" spotlight artist. I only occasionally use Reddit, but it can be a very powerful tool. If you're on there, we appreciate any upvotes or posts or whatever. It was a great way to cap off the first phase of our promotional push. 4. I'm not particularly interested in releasing any album-scale musical projects any time soon, but I HAVE been making songs with Dem Atlas, Lydia Hoglund of Bomba de Luz, the Rube and Katrah-Quey. Something to look forward to. 5. I have a ton of Spring college gigs all over the country being processed right now. If you want to bring me to your school as a poet, rapper, workshop facilitator, lecturer or whatever, definitely get in touch. Contact me at elguante@gmail.com and hopefully we can work something out.